The Adventures of an Intrepid Reader: Catching up! Well...it's been a while since I posted, but I guess that is because I haven't really been doing much card making! Still been buying up big equipment wise, and still have a wish list, but not making much! I do think about making things though. I actually need to make a Thank You card in the next few days...maybe posting tonight will help my inspiration to kick in....or my motivation at the very least! The biggest piece of equipment that I bought was a heat gun for embossing...haven't even taken it out of the box yet though! How slack is that? Since the last time I posted we have had two classes, so I thought that I should post those at the very least. 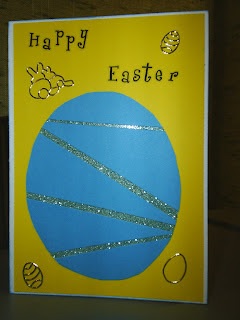 The first one was the Easter class, and the focus was on using glitter. I made this card for my son, but then ended up leaving it behind when we went away so maybe he will get it next year. 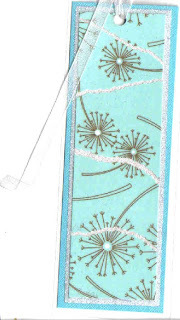 We also made a bookmark using the same technique. I would like to make more bookmarks but I will have to buy a laminator, so I will wait to see when they come on sale and get one then! Unfortunately I couldn't get a very good scan of this, but you'll get the idea! Where ever you see the white lines there is actually glitter there. Actually the class where we did this was pretty disappointing in terms of learning new things. The teacher is pregnant and has just gone back to full time work so doesn't have the time to focus on this stuff...and you could tell. Fortunately, there is someone else who she can hand onto and we did some good stuff in her first class. 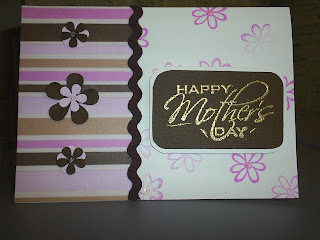 She also had three cards for us to make but in the end I only got to make two because the boxes took so long. The first was a Mother's Day card. One cool thing was that I finally got to use the sticker maker I bought when I went to the craft show a couple of months ago! Worked a treat. The last card I made could have been a Mother's Day card as well, but in the end I made it into a Happy Birthday one. It hasn't photographed very well because there were lots of shimmering bits on this card. The pink was torn along the edge to give it a less than perfect seem if you like, and then the punched flowers were added along the seem. I liked this one and it was pretty simple. I could do something similar again I am sure. Next class is not this Friday night but the one after, and it will be the new girl teaching again. I look forward to seeing what she has us doing this time! I love the Happy Mother's Day card and the Happy Birthday cards. They're wonderful and very colorsful. 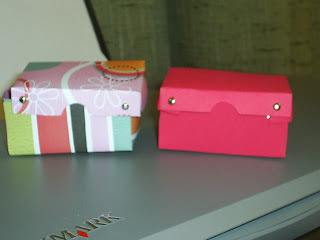 I also love the little gift box that were shown here. I want to learn how to make those! I absolutely love that bookmark! Is there any way you could write up the instructions? I would love to make those as gifts to send.